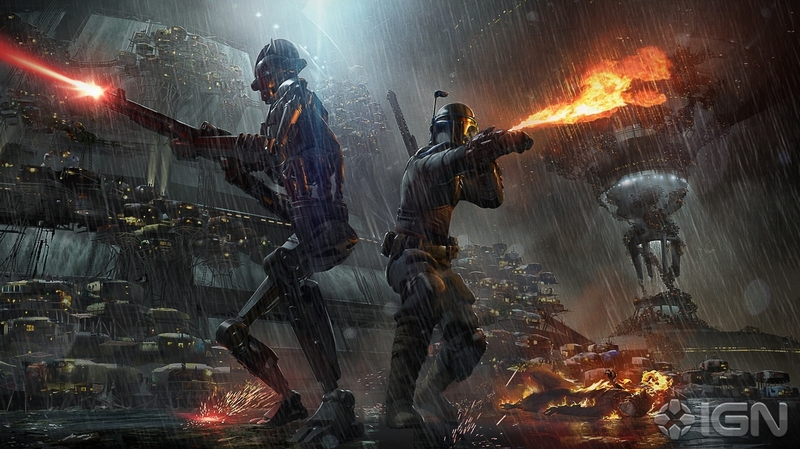 One of the more disappointing news we got this year was the cancellation of the videogame Star Wars 1313. And while the game looked and sounded awesome from just the small amount of details and footage we saw of it previously, some new information and artwork about the game just got revealed today in a story over at IGN, which will no doubt make the cancellation of this game even more painful. IGN recently had the chance to check out an early demo of the game that would’ve been shown at this past E3, and got to find out some story details about the game, as well provide some cool looking concept art that reveals who the main character of the game would’ve been. Boba Fett! Below are the new concept art and story details IGN was able to reveal about the game. 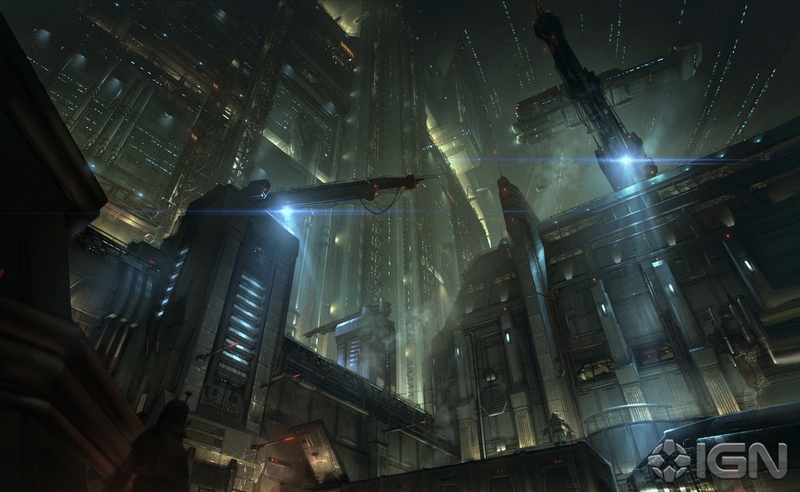 Star Wars 1313 would have begun with a prologue on Tattooine. Various bounty hunters seen in the game would have worked for different crime bosses, and Boba Fett unsurprisingly served Jabba the Hutt. Here we see a young Fett very early in the game, long before he even has his Mandalorian armor, instead wearing only his most basic outfit. Since Star Wars 1313 was meant to take place between the prequel and original Star Wars trilogies, Fett’s armor would have evolved throughout the story, changing and becoming stronger, more familiar, as he progressed. Coruscant was meticulously detailed, with structures seen here made up of derelict ships and spare parts (including TIE Fighter wings if you look closely). It’s not hard to make out a Corellian freighter here (though our source assured us it isn’t the Millennium Falcon), and you can see the gigantic scale of the environments the development team intended. Our source explained that at one point in the story, Fett would also end up in layer 1314. While 1313 is a corrupt metropolis controlled by crime families, 1314 is a rarely-explored slum that has been shrouded for years in complete darkness. 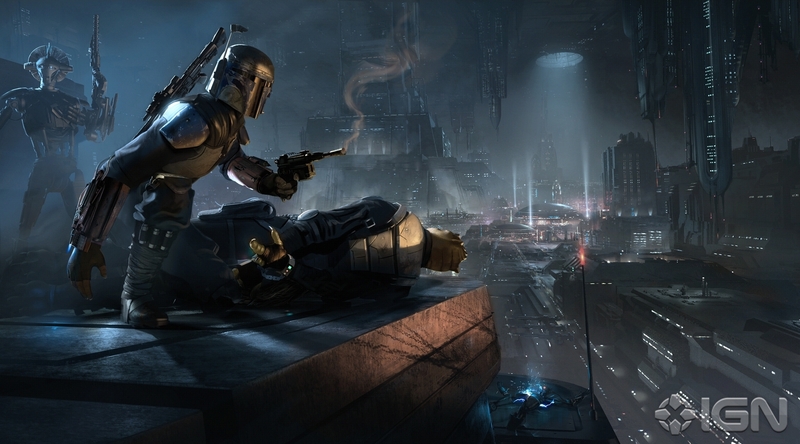 Part of the story of Star Wars 1313 would have seen Fett fighting his way through layer 1314 in search of his bounty. 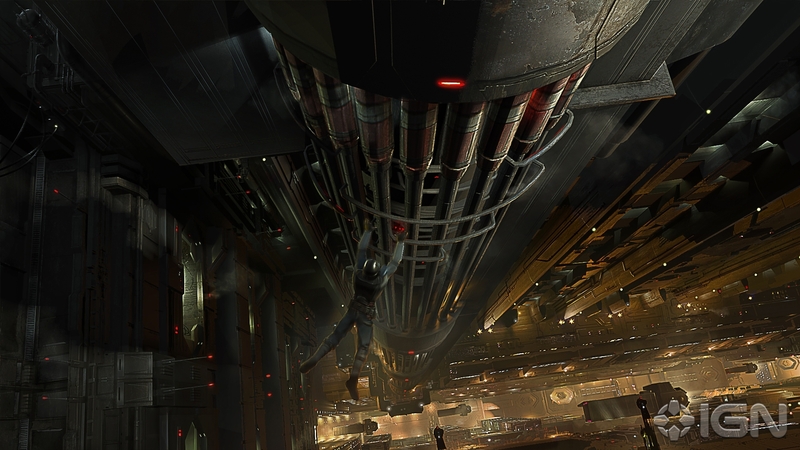 Star Wars 1313, as suggested by the E3 trailer, featured a ton of huge action set pieces and Uncharted-like platforming. The shot seen here is straight from the 15-minute demo we saw, with Fett hanging from a drain pipe. As he’s climbing, the pipe bursts, falling downward and forcing Fett to find a new place to grip. Our source tells us these scripted sequences would have been common, and the E3 trailer is a great indication of some of the high-tension moments we might have seen in the finished product. The main thrust of our demo saw Boba Fett chasing a Trandoshan through a sprawling marketplace in level 1313. As Fett chased after his target, he ran through several storefronts, including a sort of butcher shop that featured sliced-open Tauntauns hanging from the rafters. 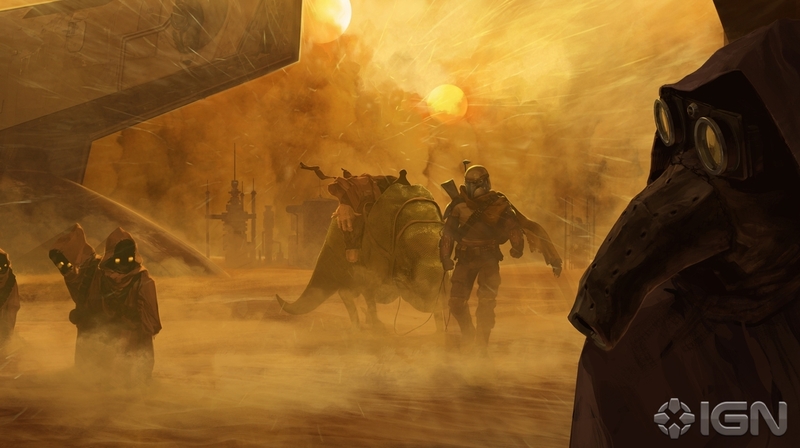 The crime families of 1313 were using these Tauntauns to smuggle spice to other planets, a plot point that our source tells us would have been central to Star Wars 1313’s story. Behind Fett is a droid companion that would have fought alongside him as his partner. We’re told that this droid would eventually have betrayed Fett, but that early in the game they fought side-by-side. 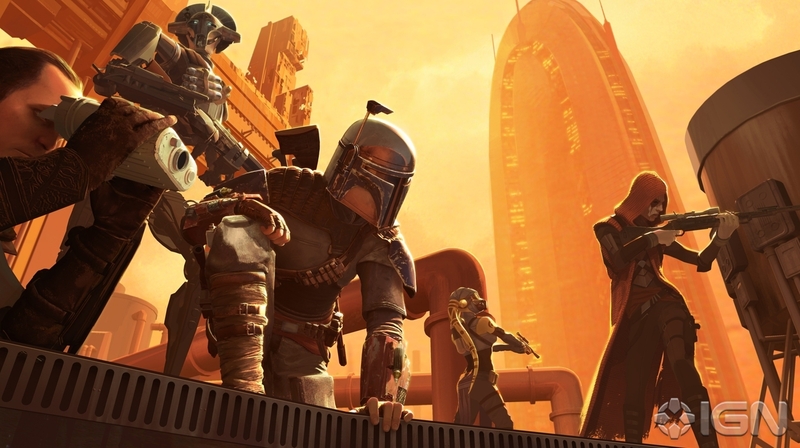 There would be other bounty hunters fighting on behalf of the various crime families of 1313, all working together toward a common goal (though, as is typical of Star Wars lore, all bets are off once that goal has been completed). This was meant to tie into the live-action TV series, our source tells us, which was set on Coruscant and focused on the same crime families as the game. I have to admit, it was kind of hard for me to read all these new details and concept art for this game now that we wont get a chance to play it, as it all looked and sounded awesome! It looked liked it was even going to tie in to what we saw of Boba Fett in the Clone Wars, as we see from the concept art, he would’ve teamed up with the droid C-21 Highsinger again from the episode “Bounty.” But with Star Wars, no ideas stay dead forever, as you never know where this story concept could show up later. Since it was supposed to take place between Episodes III and IV, maybe we’ll see this story play out in Star Wars Rebels, or a standalone Boba Fett movie? You just never know! 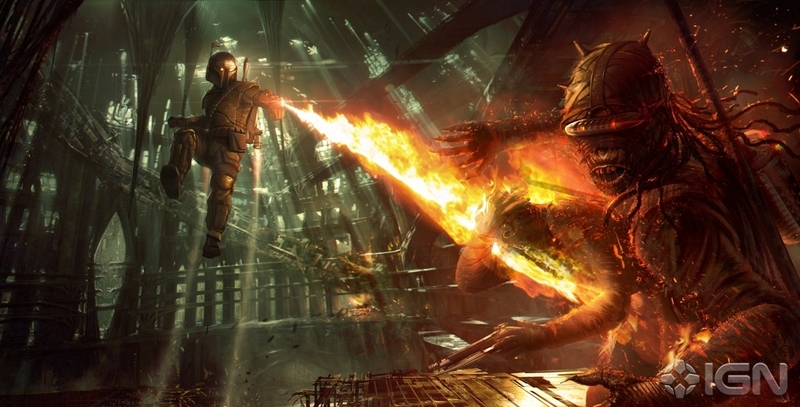 You can check out the full story about Star Wars 1313 over at IGN, as well as a video of the editors talking about the demo they got to see.